This is one of the wildest high mountain adventure treks that involve some rope climbing as well. It is a technical climb from Makalu Base Camp across Barun glacier and further to the Khumbu region of Nepal. While crossing over the high passes of Sherpani/East Col (6,100m/20,014ft) and West Col (6,135m/20,129ft), it rewards with great views of some prominent peaks. The Ice Col adventure trek is a demanding Himalayan trek with spectacular views of the mountains above 8,000 meters. They are namely Cho Oyu (8,201m/26,907ft), Lhotse (8,501m/27,890ft), Everest (8,848m/29,028ft), Makalu (8,463m/27,767ft) and Kanchenjunga (8,586m/28,170ft) en-route. The trek has some steep slopes and good for only those with alpine experience and has high level of stamina. Since there are very few modern facilities, this trek requires a well-supported team with sensible equipment including ropes and ice-axe. 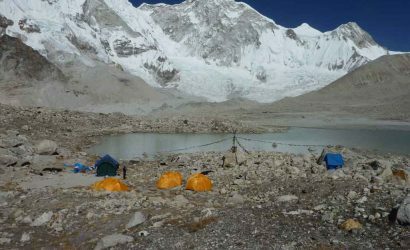 The trek connects with the Khumbu region at Chhukung crossing after the Amphu Lapcha pass (5,800m/19,029ft). 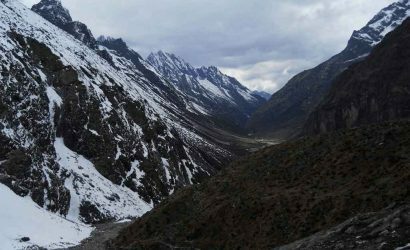 The Amphu Lapcha (also referred to as the Amphu Labtsa) pass is one of the most dramatic crossings in the Himalaya having straightforward ice-fall. 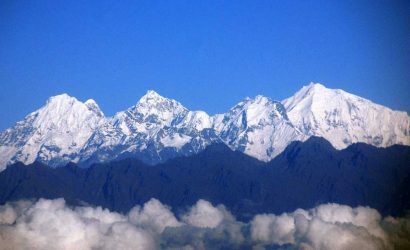 The valley is high and open, fringed with broad moraines and sharp white peaks where the views of Chamlang (7,319m/24,013ft) and Baruntse (7,129m/23,390ft) are excellent. The Khumbu region has some pristine Sherpa villages and monasteries along the Everest Base Camp trail. Namche Bazaar is the popular Sherpa hometown. There is a possibility of taking a side trip to the world famous Everest Base Camp and Kalapatthar. The trek finally ends at Lukla. 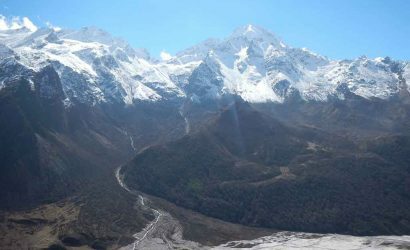 The entire Makalu-Barun, Hinku (Honku) valley and Khumbu region has a unique landscape that shelters some of the rare species of animals and plants in Nepal. 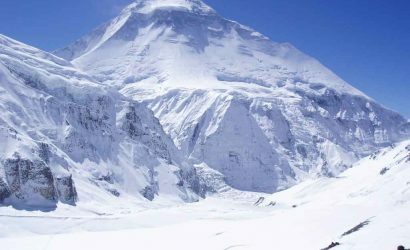 Island Peak climbing can also be combined with this trek. Trek Khandbari to Bhotebash (1,700m/5,577ft). Trek Bhotebash to Mure (1,980m/6,496ft). Trek Mure to Seduwa (1,510m/4,954ft). Trek Khongma to Mumbuk (3,400m/11,155ft) crossing over Shipton la pass (4,800m/15,749ft). Trek Mumbuk to Nghe Kharka (3,750m/12,303ft), a pilgrimage site for local people. Rest day at Makalu Base Camp for excursion. Trek to Sandy camp upper Barun Glacier (5,250m/17,225ft). Trek to East Col Base Camp (5,500m/18,045ft). Rest day and explore around. Trek over East Col (6,100m/20,014ft) to Moraine (5,550m/18,209ft). Spare day for weather conditions, etc. Trek through West Col (6,135m/20,129ft) to Panch Pokhari (5,445m/17,865ft). Trek Panch Pokhari to Amphu Lapcha Base Camp (5,200m/17,061ft). Trek Chhukung to Tengboche (3,867m/12,687ft). Trek Tengboche to Namche Bazaar (3,446m/11,306ft).